In both heavy industry and commercial office buildings compressed air is the vital fluid that provides a versatile source of kinetic energy to power many mechanical devices where large amounts of torque are required in very tight spaces. Understanding how these machines work, as well as how to operate and maintain them have been a part of my job since the early stages of my career. There are basically 2 types of compressors. 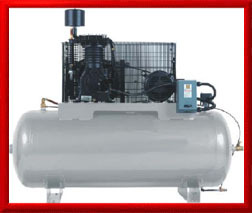 First you have the reciprocating type that uses pistons like a car engine to push air into a storage tank, and then you have the rotary type, which are usually screw type compressors. Image if you will 2 sets of fluted screws tightly meshed together. They both rotate together with their threads interlocked, but yet they remain thousandths of an inch apart. Through this gap rides a film of oil creating a seal between the two screws. The air is moved along through the flutes as gets compressed. An oil separator takes out the oil before the air is passed to the storage tank.